Eduardo Martínez-Carbonell Guillamón is a PhD student from the faculty of Health and Sport Science at University Catholic of San Antonio in Murcia, a lovely city in the south of Spain. 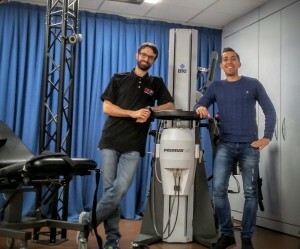 Collaborating with Université Catholique de Louvain and School Top Trades Du Sport, Eduardo is developing a research named “Bone mineral density in a population of the region of Murcia and its relationship with physical exercise”. His aim is to search for risk factors of osteoporosis and then find a prevention plan based on physical exercises. From September Eduardo joined our University as a visiting PhD student collaborating with PGR Francesco Ferraro, on the relationship between trunk muscles training and balance, under the supervision of Professor Alison McConnell, Professor Tom Wainwright and Dr. James Gavin. Working together at the Orthopedic Research Institute is being a gratifying experience. We both are aware that falls prevention is a sensitive topic that required an interdisciplinary approach. To accomplish and maintaining a high-quality standard for our volunteers, we are working side by side to get the best out of this experience and actively collaborate in the field of elderly health care. From this collaboration we hope to improve our knowledge and networks for research to come.